Skye, a cheeky baby puffin, finds herself on an unexpected adventure in Scotland's Firth of Forth. This sequel to the best-selling Harris the Hero is written in Lynne Rickards' signature humorous rhyme with adorable watercolour illustrations. One morning Skye, a cheeky baby puffin with an appetite for adventure, sneaks out of her parents' burrow, tumbles off the cliff edge and accidentally lands on a passing gannet's back! Skye's thrilling journey takes her around the Firth of Forth and finds her in a few tricky situations -- a perilous piggy-back ride, an icy dip in the sea and a host of Scottish bird life. 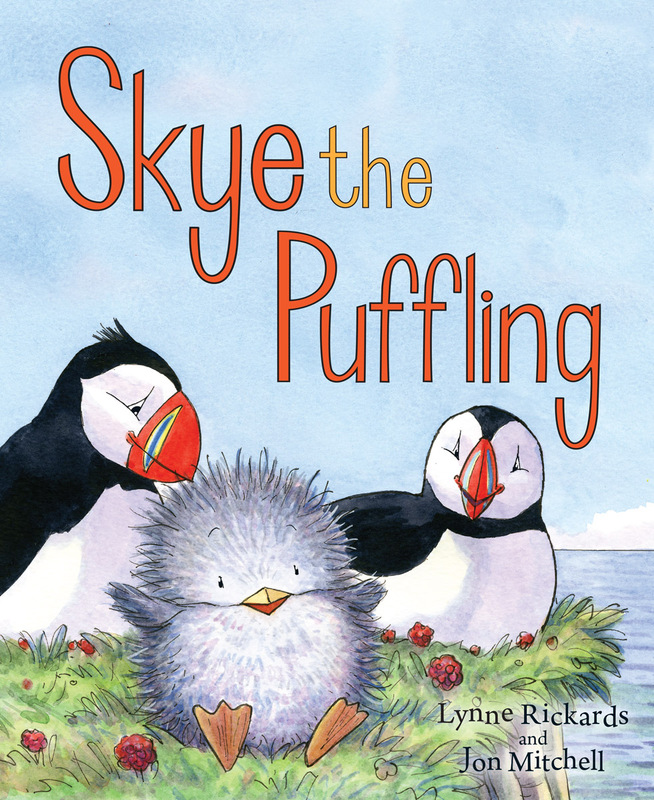 Written in Lynne Rickards' signature rhyme, this charming coming-of-age story features dynamic watercolour illustrations of Scottish sealife and a very cute puffling! The adorable sequel to the best-selling Harris the Hero is set in Scotland around the Firth of Forth, the Isle of May, North Berwick and the Bass Rock. Lynne Rickards was born in Canada and now lives in Scotland with her husband and two children. She grew up reading Dr Seuss books and as a result she loves writing in rhyme. Her picture book Pink! was nominated for a Royal Mail Book Award. She is the author of two other Picture Kelpies: Lewis Clowns Around and Harris the Hero. Jon Mitchell graduated with a BA Hons in Graphic Design from Wolverhampton Polytechnic. He worked as an architectural illustrator before joing Ragdoll Productions, where he illustrated TV characters such as the Teletubbies and Rosie and Jim. Jon has been working as a freelance illustrator for the last fifteen years and has illustrated numerous children's books including Flat Stanley. He lives in Evesham, Worcestershire, England. 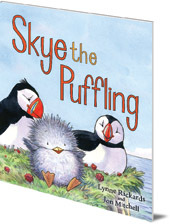 Skye the Puffling is in Floris Books' range of Picture Kelpie Scottish children's picture books. Parents of young children might also enjoy the dedicated Picture Kelpies website. Download and print out games, colouring and jokes for your children based on Picture Kelpie favourites, and find out more about these quality Scottish picture books to enjoy together.